"The bond we created in just one week was unimaginable. " 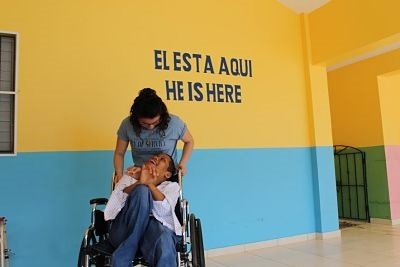 "My experience at Mustard Seed Communities in Cangrejo was unforgettable. Not only was I blessed with the most amazing mission trip group, but we were also welcomed with unbelievable love by the staff and children. I was pushed out of my comfort zone, but only to find I am much stronger than I ever thought. These children taught us more than we could ever do for them. One specific child, whom I am with in this picture, made me the person I am today. The bond we created in just one week was unimaginable. Every morning, waking up knowing I had the opportunity to spend the day with this boy and make him smile or feel just a little less pain, I was taught true happiness. His name is Brandy, and I will be forever grateful that he became such an integral part of my life."